This is the debut album as a leader by Polish Jazz saxophonist Dariusz Herbasz and his double tenor saxophone quintet, which also includes saxophonist Tomasz Grzegorski, pianist Piotr Mania, bassist Adam Zuchowski and drummer Tomasz Sowinski. 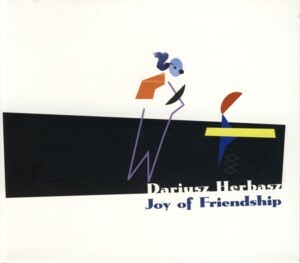 The album comprises of six original compositions, all by Herbasz and was recorded at the superb Tokarnia Studio with engineer Jan Smoczynski presiding. If I would have been subjected to listening to this album in a blindfold test situation, I would be sure this is an unknown recording of mid 1960s Blue Note period, as this music has the distinctive feel of modern mainstream, which flourished at the time and was captured for posterity by Rudy Van Gelder. The warmth and presence of the overall sound and the crisp piano sound are quite remarkable. But of course there is also the music, which stylistically returns to that wonderful period that summarized the Jazz tradition bringing it to sheer perfection on one hand and opening doors for the free form just wide enough to make it interesting on the other hand. These wonderful compositions are truly grand on every level; there are some beautiful melancholic melodies, several great vamps, and a strange feeling of familiarity even upon the first hearing. I must admit that it's been a while since I've heard a collection of such superbly crated tunes on one album. Herbasz takes a considerable risk with the double tenor saxophone frontline, since such setting is often prone to clashes and outright contest rather than cooperation, but also opens intriguing opportunities of harmonizing and completing each other. It's a pleasure to hear how well this situation was handled here, enabling both players to solo as well as play together in a variety of quite distinct musical surroundings and atmospheres. Both saxophonists [lay remarkably well, both when simply stating the lyricism of a melody or venturing into almost free form excursions. The rhythm section is excellent as well, providing the ideal support for the soloists and framing the musical expressions with just the right amount of direction, allowing space for less constrained experimentation at times. The pianist is an ideal harmonizer and his vamping is a classic form obviously learned from the best. Bass is round, clear and worm and the drums play exactly the amount of time keeping to keep everything tick, with some great topping of inventive drumming. The overall dynamic sensitivity of the entire rhythm section is simply just what the doctor ordered to make the music perfect. This is a remarkable debut and a brilliant Jazz album, which comprises of everything that makes Jazz such a great music: it's interesting, artistic, intelligent, well played and above all honest, simply stating the artist's credo and not trying to be something it isn't. Well done indeed!